Diggity Dog Daycare is proud to present the annual Diggity Dog Dip 2018. 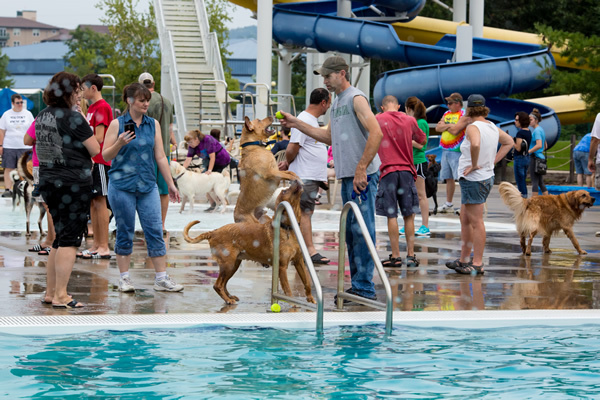 This year the Diggity Dog Dip is Saturday, September 1st at the Onalaska Aquatic Center at Van Riper Park from 10am-2pm. This is a fundraiser for various animal rescues and the Onalaska Park and Rec Department. The Dip also aids in the maintenance of the dog exercise area right behind the pool in Onalaska. You can keep up with new details by “Liking” our Diggity Dog Dip Facebook page. Just search “Diggity Dog Dip”. While you’re at it, “Like” our Diggity Dog Daycare page too and keep up with the fun and goings on at Diggity Dog Daycare. 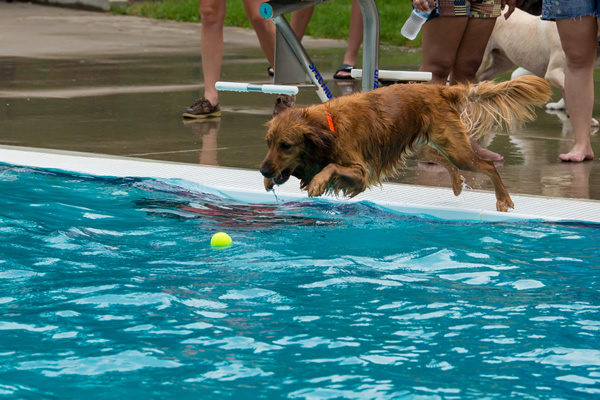 Saturday, September 1st is a day the pool is all about the dogs for an open swim day. You can bring your family dog to the pool and let them swim with other social dogs in an off-leash environment. The pool is fenced in so all the dogs can be off leash to play, swim, run and romp. We will have separate kiddie pools for puppies and small dogs too! The pool is a “Zero Depth” pool which means it slowly and gradually gets deeper. This is perfect for dogs that only want to go wading. Bring your fetch and water toys and get ready for some fun! When:Saturday, September 1st 2018. 10am-2pm. 1. All Dogs must be vaccinated for Bordetella (kennel cough…which is NOT part of the usual vaccination battery) by no later than Friday August 24, 2018. This rule will be strictly enforced as this virus is very contagious. Also required are vaccinations for Distemper and Rabies. All shots must be given or updated at least 1 week prior to the event. Vaccination documents must be presented prior to entry or at the time of Pre-Registration. A liability waiver must be signed prior to entering pool area or at the time of Pre-Registration. ***PRE-Registration: For your convenience, and in an effort to avoid delays as well as minimize entrance lines, we HIGHLY recommend pre-registering for the Diggity Dog Dip. 2. “1-And-Done”: No aggressive dogs are allowed. One act of aggression and the dog Must be removed. 3. Humans are NOT allowed in the water. 4. Dogs must arrive at the pool ON-leash. They may be released to play inside the pool area. Due to the large number of dogs and humans together, the dogs will need to be leashed when not in the water area. 5. Please NO EXTENSION leashes on the dogs in the pool area. They are easily wrapped around dog and human legs. This will cause a nasty fall and potential injury. 6. It is advised to have your dog’s nails trimmed prior to the event. Running on the cool deck/cement of the pool facility may crack nails and cause bleeding. Refreshments will be available for humans as well as Frosty Paws ice cream treats for the dogs. Canine Control Cops and Canine Valets will be available to help with the handling of the dogs as well as monitor the pool activities. See the FAQ page for answers to commonly asked questions.